Austria, Vienna(ANN)-Austria says it plans to close at least seven mosques and expel dozens of imams and their families in a crackdown on what it calls “political Islam” and foreign funding of religious groups. Interior Minister of the right-wing government Herbert Kickl announced the plan on Friday, saying up to 60 Turkish-funded imams could be deported. He also said a total of 150 people risked losing their right to residence in the country. The Federal Chancellor Sebastian Kurz also said the government was shutting down a Turkish nationalist mosque in the capital Vienna and dissolving a group called the Arab Religious Community that runs six other mosques. 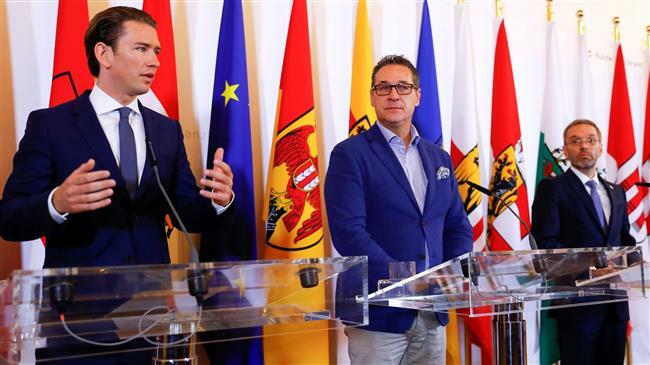 Kurz, who became chancellor in December in a coalition with the anti-migration Freedom Party, said the decision was made after an investigation into images of children, who were playing dead and reenacting the World War I battle of Gallipoli in Turkish-backed mosques. He was referring to images, which emerged in April, showing children waving Turkish flags and then playing dead. The new measures are “first significant and necessary step in the right direction,” said Vice Chancellor Heinz-Christian Strache. “If these measures aren’t enough, we will if necessary evaluate the legal situation here or there,” he added. Austria, however, is shutting down the mosques based on a 2015 tough “law on Islam” that among other things bans foreign funding of religious groups. In a previous job as minister in charge of integration, Kurz oversaw the passing of the law. Austria, a country of 8.8 million people, is home to roughly 600,000 Muslims, most of whom are Turkish or have families of Turkish origin. Vienna had also passed a law in May 2017, banning Muslim women from wearing full-face veils such as burqas and niqabs in public. Under the law, which came into effect in October 2017, violators face a fine of 150 euros (nearly $180) and police are authorized to use force with people who resist showing their faces. Similar restrictions, known as the “Burqa Ban,” have also been adopted in other European Union countries like, France, Belgium and the Netherlands. Denmark has also banned garments that cover the face late last month. Those violating the law risk a fine of 1,000 kroner (£118).